Oceans cover seventy percent of our planet's surface. But, how much of that is frozen? 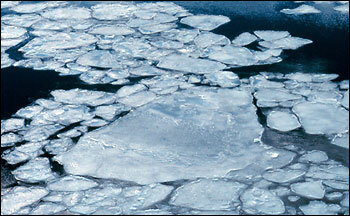 At any given time during the year, sea ice (frozen seawater) covers millions of square kilometers of the ocean. In the Arctic, some sea ice survives year after year, whereas most Antarctic sea ice melts away each summer and reforms the following winter. Seasonal cycles in sea ice extent determine whether many marine mammals such as polar bears, seals, and penguins will have somewhere to hunt, feed, and breed. The extent and thickness of sea ice also dictate whether important transportation routes are safe or navigable by ships carrying valuable raw materials out of the Arctic. Perhaps most significantly, sea ice is important to the long-term health of the entire planet. The amount of area covered by Arctic sea ice is considered a sensitive indicator of global climate. Because of its high albedo, sea ice helps keep the planet cool by reflecting a high percentage of the sun's radiation back into space. In contrast, during the summer season when there is much less ice in the Arctic, the ocean absorbs most of the incoming radiation. How much sea ice grows, and the rates at which it grows and melts, depend on the heat and energy exchanged across boundaries between the ice and the ocean below and the atmosphere above. As you will see in this investigation, the temperature and salinity (saltiness) of ocean water are the primary factors driving this flow of energy between sea ice and the surrounding environment. In Part A, you will learn about how sea ice forms and influences ocean currents around the globe. In Part B of the investigation, you will look at how sea ice thickness changes over time. Finally, in Part C, you will use NSIDC sea ice index data to explore changes in sea ice extent on multiple time scales including months, years, and decades. explain why changes in sea ice over time are important. In these pages, you'll find three kinds of questions. Checking In questions are intended to keep you focused on key concepts. They allow you to check if the material is making sense. These questions are often accompanied by hints or answers to let you know if you are on the right track. Stop and Think questions are intended to help your teacher assess your understanding of the key concepts and skills. These questions require you to pull some concepts together or apply your knowledge in a new situation. Your teacher will let you know which questions you should answer and turn in.